Great news! On Monday morning, Judge Simon denied PGE’s motion to dismiss the DRA’s Clean Water Act lawsuit. In its motion, PGE had argued that the Clean Water Act does not authorize lawsuits by private citizens, including groups like the DRA, to enforce water quality requirements at hydro projects like Pelton-Round Butte. Judge Simon’s decision thoughtfully rejected each of PGE’s arguments on the issue, ultimately finding that the company’s interpretation of the Clean Water Act “rewrites the statute.” Read the whole decision here. Judge Simon’s ruling, which allows the DRA’s lawsuit against PGE to proceed, is great news for lovers of the Deschutes River, and a critical step in our efforts to return cold, clean water to the lower Deschutes. But it’s also a great victory for river advocates across the country: a decision in PGE’s favor would have impacted the ability of citizens and states to protect water quality on all rivers impacted by hydroelectric projects. This is truly an important decision for the Deschutes River, and we’re eager to finally move on and address the merits of the case. Judge Simon’s ruling ensures that the DRA will have the ability, as the Clean Water Act clearly provides, to hold PGE accountable for violations of water quality requirements at Pelton-Round Butte. 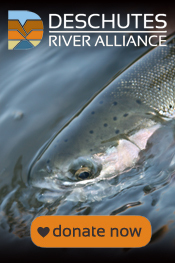 This is the first step to restoring the river we all love. Keep an eye on the blog for more updates on the lawsuit, and on all of the DRA’s science and advocacy efforts. Cooler, cleaner H2O for the Deschutes!